A venue which sells itself as "New York's only Welsh pub" is facing a large fine, accused of trying to uphold its distinctive culture through discrimination. Longbow Pub & Pantry put out an advert for a new bartender which said: "being British definitely works in your favour." The New York City Commission on Human Rights said the pub has violated discrimination law, and it could now have to pay a fine of $7,500 (£4,800). Owner Michael Colbert, who is originally from Wales, told New York television station PIX 11 "we are looking for people who understand British culture." 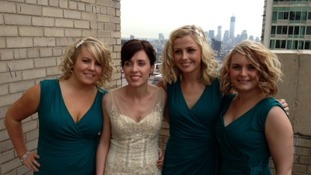 Members of a wedding party from Wales who are stranded in New York due to Hurricane Sandy have told ITV Wales their airline has informed them they won't be able to return to the UK until at least Saturday. Around 30 guests had flown out to America to celebrate the couple's big day but many have since been unable to fly home as flights out of New York have been cancelled. Some have also had difficulties booking hotels and nine guests have been forced to share one room. More than 200 Welsh school children and a 30 strong wedding party are among those trapped in New York tonight as the city faces a potentially deadly storm surge. They are among thousands of British tourists being forced to seek shelter as flights to and from the East coast of America are cancelled and thousands of Americans are having to evacuate their homes. Pupils from Carmarthen who have arrived in New York today, just as the city prepares for hurricane Sandy, are 'safe and secure' according to the school. Pupils and staff from Ysgol Gyfun Bro Myrddin have been in America since last week and have already visited Washington D.C and Philadelphia. We, the staff and pupils of Bro Myrddin are all enjoying our American trip. At present it is cloudy but the forecasted terrible weather has not yet arrived. We will adjust our plans in response to the strength of the hurricane / storm. The safety of the children will have the highest priority over the next four days.